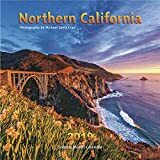 The magnificent beauty of Northern California is everywhere from its dramatic coastline and serene giant redwoods to its stunning peaks in the high Sierras. Along the coast you have the dramatic cliffs of Big Sur, the picturesque coastal villages like Monterey, Carmel and Santa Cruz and the sweeping vistas of San Francisco. Inland you have the gorgeous vineyards in Wine Country and the pristine lakes and forests in Gold Country. You also have the waterfalls, meadows and snow capped granite peaks in world famous locations like Yosemite, Kings Canyon and Lake Tahoe. Our calendar visits the most beautiful of these places and lets you enjoy them year round. The iconic Golden Gate Bridge, miles of spectacular coastline, and steep mountains stretching their fingertips to the skywelcome to the Golden State of California. 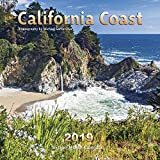 Get lost in the arresting beauty of the 2019 California wall calendar as the spacious grids give you room to plan your next journey. Sixteen-month wall calendars include each month in 2019 as well as the last four months of 2018, printed on paper certified by the Forest Stewardship Council. With stunning coastlines, impressive mountains, sublime deserts, and amazing national parks, California’s scenery is truly breathtaking. From the tallest redwoods to the craggy cliffs along the Pacific coast, the state's natural beauty is enlightening and inspiring. 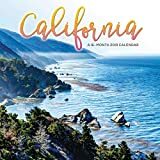 California’s picture-perfect landscapes splash across the pages of this deluxe wall calendar. 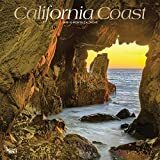 In Central California between San Francisco and Big Sur you will find some of the most beautiful, inspiring coastline in all of the United States. Pristine beaches, towering cliffs, crashing waves, waterfalls and abundant flora and fauna combine with the ever-changing seasons and lighting to create this magnificent coastline. There are also many stunning bridges, lighthouses and harbors along this coastline visited by millions each year. From the pier at Trinidad Bay in Eureka to the sparkling coast of Los Angeles, California at the Edge of the Sea explores the interaction of sea and land. The Pacifi c Ocean sweeps along more than 800 miles of California coastline, and we share the changing personalities of both sea and shore, from the craggy headlands of Point Lobos to the easy shores of La Jolla Cove in San Diego. Surf's up! Even when there are no surf boarders to entertain them, the sea gulls still seem to enjoy the dramatic cresting waves delivered up by the Pacific Ocean along the California coast. Located on the Marin Headlands near Sausalito, the original Point Bonita light went into service in 1855, but its 56-foot tower put the light 306 feet above sea level. At that height the light was frequently obscured by fog. The light was moved to its current location in 1877 with a focal height reduced to 124 feet. The rugged coast along Big Sur mirrors the dramatic clash of tectonic plates colliding beneath the surface of the land and the sea. This coastal plate, called the Salinan block, began shifting northward 65 million years ago and its slow-motion collision with the Pacific Ocean crust uplifted ancient sandstone and siltstone that now does battle with the relentless Pacific Ocean. The footsteps of a loan hiker mark the sand on Cuyler Harbor Beach on San Miguel Island, part of Channel Islands National Park. Across the Santa Barbara Channel, San Miguel is the westernmost of the Channel Islands. The island was home to Chumash people for some 12,000 years, but today birds, seals and sea lions are the most frequent beach visitors. A line of fog stretches along the Big Sur coast on a quiet morning with wild flowers in bloom. Who can sleep with such a restless ocean crashing into the rocks at La Jolla Cove in San Diego. This sea lion and all the other marine life here are protected as part of the San Diego-La Jolla Underwater Park refuge area, but the beach is open to humans who may want to swim with the fish. The sea sweeps the shore on a brilliant afternoon off Highway 1 along the Central Coast. The Gaviota coastline extends for 76 miles from Coal Oil Point in Goleta to Point Sal west of Santa Maria in southern Santa Barbara County. Areas near the coast have long been dominated by large ranches that supported the rural character of the land, but there is continuing pressure for new housing and industrial development. This long photographic exposure shows off the scenic coast near Muir Beach, about 16 miles north of San Francisco. For swimmers, these rocks don t look inviting, but there is a real sand beach nearby, and Muir Woods National Monument is only about two miles away. Arriving by boat or helicopter may be the best ways to enjoy this beach beneath the dramatic cliffs carved into the hills near Carmel. Trinidad Bay near Eureka received its name from Spanish explorer Bruno de Hezeta who discovered this inlet on Trinity Sunday in 1775. By the 1870s there was a wharf to accommodate passengers and cargo. In 1946 entrepreneur Earl Hallmark purchased this waterfront property from Hammond Lumber Co. and built the original wooden pier. Rebuilt in 2000, the new pier serves commercial and sport fisherman, as well as the hundreds of boats moored in the bay. An unrelenting wind sweeps across Venice Beach in Los Angeles on an early November day that seems to confirm the imminent arrival of winter. While it may look abandoned, Venice Beach is a destination for millions of visitors each year who enjoy shopping along the boardwalk, sharing in the array of recreation and amusements the beach offers. Pigeon Point Light Station first served as an aid to navigation in 1872.